All that remains of one of the completely eroded islands. Simon Albert. Previous studies examining the risk of coastal inundation in the Pacific region have found that islands can actually keep pace with sea-level rise and sometimes even expand. However, these studies have been conducted in areas of the Pacific with rates of sea level rise of 3-5 mm per year – broadly in line with the global average of 3 mm per year. 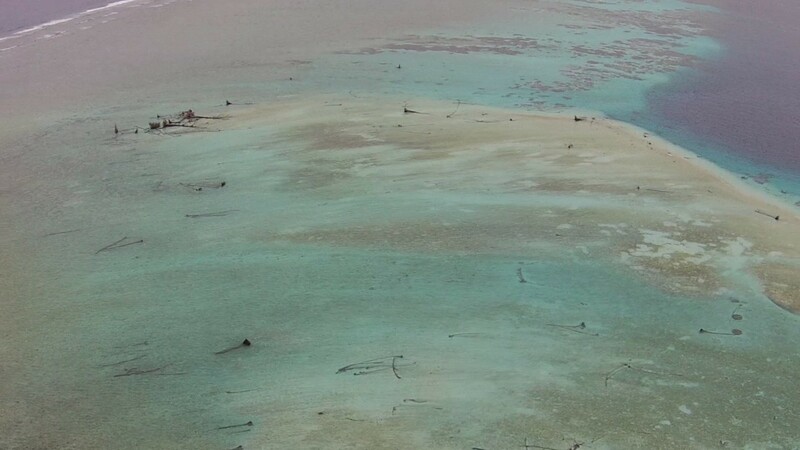 For the past 20 years, the Solomon Islands have been a hotspot for sea-level rise. Here the sea has risen at almost three times the global average, around 7-10 mm per year since 1993. This higher local rate is partly the result of natural climate variability. These higher rates are in line with what we can expect across much of the Pacific in the second half of this century as a result of human-induced sea-level rise. Many areas will experience long-term rates of sea-level rise similar to that already experienced in Solomon Islands in all but the very lowest-emission scenarios. Natural variations and geological movements will be superimposed on these higher rates of global average sea level rise, resulting in periods when local rates of rise will be substantially larger than that recently observed in Solomon Islands. We can therefore see the current conditions in Solomon Islands as an insight into the future impacts of accelerated sea-level rise. We studied the coastlines of 33 reef islands using aerial and satellite imagery from 1947-2015. This information was integrated with local traditional knowledge, radiocarbon dating of trees, sea-level records, and wave models. Wave energy appears to play an important role in the dramatic coastal erosion observed in Solomon Islands. Islands exposed to higher wave energy in addition to sea-level rise experienced greatly accelerated loss compared with more sheltered islands. Twelve islands we studied in a low wave energy area of Solomon Islands experienced little noticeable change in shorelines despite being exposed to similar sea-level rise. However, of the 21 islands exposed to higher wave energy, five completely disappeared and a further six islands eroded substantially. These rapid changes to shorelines observed in Solomon Islands have led to the relocation of several coastal communities that have inhabited these areas for generations. These are not planned relocations led by governments or supported by international climate funds, but are ad hoc relocations using their own limited resources. 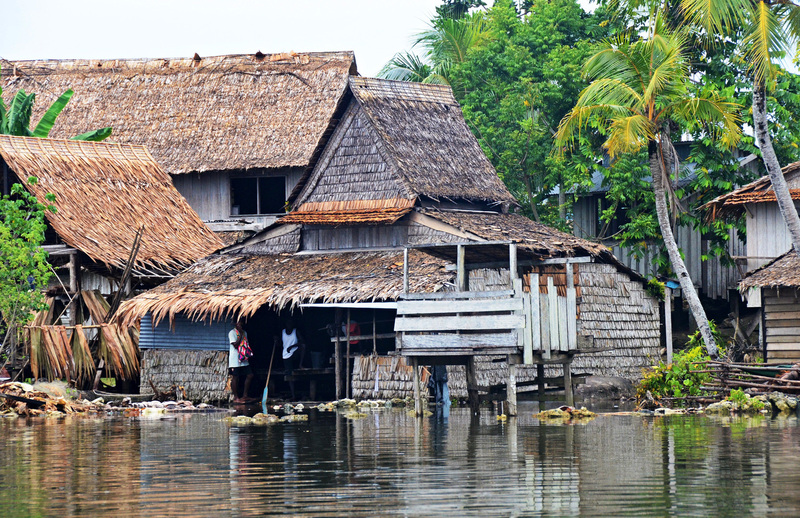 Many homes are close to sea level on the Solomons. Simon Albert. The customary land tenure (native title) system in Solomon Islands has provided a safety net for these displaced communities. In fact, in some cases entire communities have left coastal villages that were established in the early 1900s by missionaries, and retraced their ancestral movements to resettle old inland village sites used by their forefathers. In other cases, relocations have been more ad hoc, with indivdual families resettling small inland hamlets over which they have customary ownership. In these cases, communities of 100-200 people have fragmented into handfuls of tiny family hamlets. Sirilo Sutaroti, the 94-year-old chief of the Paurata tribe, recently abandoned his village. “The sea has started to come inland, it forced us to move up to the hilltop and rebuild our village there away from the sea,” he told us. In addition to these village relocations, Taro, the capital of Choiseul Province, is set to become the first provincial capital in the world to relocate residents and services in response to the impact of sea-level rise. Interactions between sea-level rise, waves, and the large range of responses observed in Solomon Islands – from total island loss to relative stability – shows the importance of integrating local assessments with traditional knowledge when planning for sea-level rise and climate change. Linking this rich knowledge and inherent resilience in the people with technical assessments and climate funding is critical to guiding adaptation efforts. Last month, the Solomon Islands government joined 11 other small Pacific Island nations in signing the Paris climate agreement in New York. There is a sense of optimism among these nations that this signifies a turning point in global efforts. However, it remains to be seen how the hundreds of billions of dollars promised through global funding models such as the Green Climate Fund can support those most at need in remote communities, like those in Solomon Islands. I’m confused! Putting aside doubts about the possibility of local sea-level rise, which seems odd to me at least(! ), the key point is that “This higher local rate is partly the result of natural climate variability.” So, any evidence linking it to alleged man-induced climate change appears to be tenuous at best. How much is “partly”? 1%, 10%, 99%??? Its erosion not sea rising. Here is the sea level plot for Honiara from very accurate instruments put in giving over 20 years of records. If the sea level is rising, the data doesn’t show it. The senior author of this paper has had to issue statements that the media have misunderstood his research. Here’s a little article that illustrates well why it is very important for scientists to communicate clearly. Was it the Media or the Authors themselves who were responsible for distorting the public view of their research? Yes, we appear to have one sad individual who loves hanging out on Sciblogs in the guise of various sock puppets. Gradually blocking them all. Well maybe, but there is a slippery slope from policy to suppression of alternative views and censorship. As you know, the occasional blog author here has used “moderation” to rather heavy-handedly block me from disagreeing with their own views. A good blogging site isn’t just a place for like-minded people to read each others posts and pat each other on the back. They have to expect some healthy criticism, particularly if there posts are pushing an agenda. The “everyone” in “ruin it for everyone” also includes those people who do not share the views of the blog author. I can understand why you would block for personal attacks, obscenities, etc, but the “sock puppetry” issue seems a bit odd to me. Are you suggesting that one or more of Bob Keplan, Chris Morris or Maggy Wassilieff are in fact the same person, or are using names of other people who would never hold the same views? Even if they are all the same person, I don’t really see a problem. We can see exactly who the sock puppets are. The issue is not odd at all. People who want to force their views on others set up numerous accounts and post messages largely along the same point of view to overwhelm every other view and make it appear like the line being pushed is the mainstream one. If you are happy to read that stuff, go elsewhere. We won’t tolerate it here. And don’t talk to me about censorship. For seven years I pretty much let everyone say whatever they wanted to on this website. But lately a small number of people are ruining it for everyone so we’ve had to put some “rules” in place. My name and academic title is Dr Maggy Wassilieff. I am a retired botanist and one time Editor of the NZ Journal of Botany. I post under my own name only – on a number of blog sites. I wouldn’t know how to operate more than 1 account. I don’t understand what a fake email address would be…. i.e. I’m not computer savvy. Could you please make it clear to all your readers that I am not the subject of your sock- puppet accusation? Yeah, same here Peter. Putting vague accusations on a page where there are several commenters does rather leave it up to the imagination of the reader who you are alluding to. Thanks Maggy, you are very welcome here. If you were a sock puppet your comment wouldn’t have appeared! @stephen what you are missing is the entire point. We are happy to host healthy discussion and debate. You don’t have to use your real name. But we won’t let you manipulate the discussion by posting under different names and fake email addresses and trying to write in a different style so people won’t notice its all from the same person. That’s just sad really – suggests some people literally have nothing better to do with their time.. .
Peter, you really need to take a step back and reread what you are writing! Now it looks to the reader like I “manipulate the discussion by posting under different names and fake email addresses and trying to write in a different style so people won’t notice its all from the same person”! Please clarify which posters are being alluded to here (or at least which are not). @Stephen You have got the wrong end of the stick. If we thought you’d done that Stephen, your comments wouldn’t be appearing here either! If you were a sock puppet your comment wouldn’t have appeared! I wonder how many of your readers knew this? I certainly didn’t. Yes, I am sensitive about censorship… I am repeatedly abused on Kiwiblog when I post material that illustrates climate change science is not settled science. If you have doubts about the integrity of one of the commenters here, take it up with that person directly. (2) your first comment post above (i.e. “Yes, we appear to have one sad individual who loves hanging out on Sciblogs in the guise of various sock puppets. Gradually blocking them all”) lacks context, and I question whether it was really necessary if the socking comments have already been removed and relevant people blocked. All it did was leave it up to the imagination who was being alluded to! @Stephen if you are being “systematically abused” by other posters on a site you should appeal to the moderator or site admin. If they won’t take you seriously they don’t deserve your time and effort. Life is too short. Re the one sad individual working the sock puppets, I found the poster to be in breach of our comments policy so deleted the latest post and blocked the account.